Gas logs fireplaces bring back memories like warming up by the fire after coming in from the frigid, cold, weather outside. Or the warmth of the fire against your frozen fingertips, as you watch the snow quickly dissipating from your fingertips. Great childhood memories, yet, in today’s world, chopping wood and coaxing a fire to life, well it’s just not feasible. In today’s typical home, both parents work to make ends meet and there just isn’t enough time in the day for these simple pleasures. What if you could bring back these memories, live them all over again with your children, without the back breaking wood chopping or enticing of flames? Plus, most homes don’t have built-in fireplaces anymore. It’s just too much hassle. Propane gas log fireplaces provide an alternative to burning wood, protect natural resources, yet, provide instant heat and realistic flames just like the fireplaces from the older days. Gas log fireplaces now come in a variety of styles, colors, and sizes. You simply choose the type of gas logs and whether you want propane or natural gas to fuel your fire. Plus, gas logs fireplaces can be installed in almost any home, with or without a chimney, and without any major construction to the house. While some may believe that gas logs are dangerous, when installed by a professional, gas logs can bring you years of enjoyment and memories with minimal maintenance. Although a chimney is not important when installing gas logs in Greensboro, ventilation is. 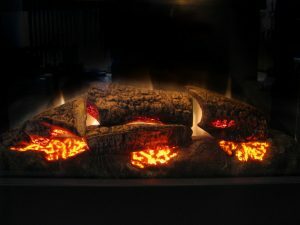 Having a professional install your gas log fireplace will ensure that you have the proper ventilation system plus they can go over any questions you may have, instruct you on maintenance and inform you how often your gas logs need to be replaced or how often your ventilation system should be inspected. Also, remember that although gas logs don’t produce the fiery embers like dry wood does, it is still important to have a screen or doors on your fireplace to ensure that safety for your children and pets and to prevent any accidents. Although you do want to periodically clean the screens and logs, make sure you turn the propane gas off first as a safety precaution. Remember, typically anything that burns or generates heat can also produce carbon monoxide, including gas logs and fireplaces. Carbon monoxide is an invisible, odorless and tasteless gas that is lethal to human. This is why you should always have a carbon monoxide detector in your home. Also, make it a routine to check the batteries on the carbon monoxide detector before turning on any heat in the home. In short, gas logs in Greensboro can bring you and your family years of enjoyment when installed professionally and maintained correctly. Safety precautions, including carbon monoxide detectors and screens, should always be used. Berico Heating and Air Conditioning, offers gas logs in Greensboro for both propane and natural gas fireplaces, as well as professional installation. If you have been thinking of adding a fireplace or gas logs, just give us a call today at (336) 496-2509. We have a showroom at all of our locations in Greensboro, Eden, and Burlington to see what we offer.